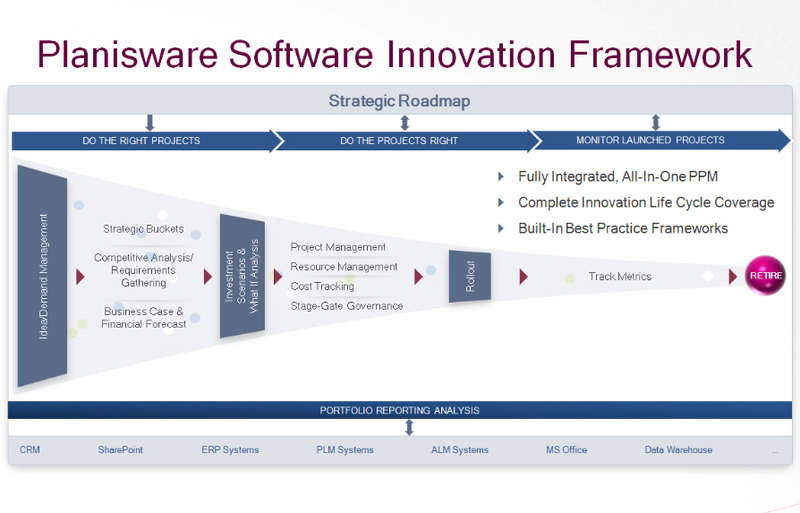 What does Planisware software offer and what makes it different from other PPM solutions? What does Planisware software do? Planisware customers are typically medium and large organizations with implementations that range anywhere from fifty to tens of thousands of users. 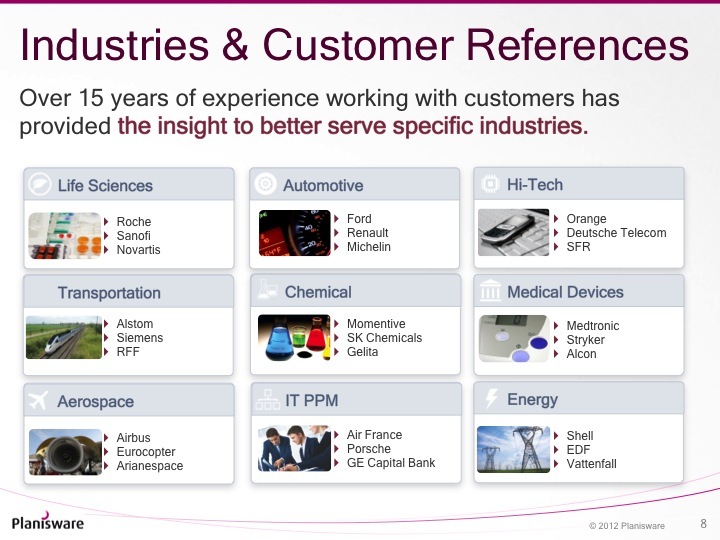 Our list of references include customers within aerospace & defense, automotive, chemical, fast moving goods, high-tech, life sciences, energy, engineering, IT PPM. How widely has Planisware been adopted? Planisware is the leading PPM solution for NPD and our customer base includes over 40% of the top 60 R&D spenders worldwide. Industry giants such as Ford, Philips, Pfizer, Airbus, DuPont and Shell as well as dynamic mid-sized organizations such as Martin-Baker, Rexam and Brocade have chosen Planisware as their PPM software solution. Interested in learning more about Planisware? Planisware is an independent software vendor, committed to the development of its Project Portfolio Management solution. Planisware's presence, growth and financial results ensure that we will be able to serve our customers for many years to come. Planisware's customer maintenance renewal rate is 99%. Our oldest customer of 22 years, Arianespace, is running the latest version of our solution. Want to see more references? Have a look at a more comprehensive list. Planisware consulting services can be complemented by services from large business and technical organizations such as PriceWaterhouseCoopers, CGI, Wipro or Cap Gemini as well as specialized services from companies such as PRTM, Kalypso, XRiver, and Oresys. For more information, visit our list of partners and distributors. Planisware is followed by all of the major IT Research companies. Planisware is a solid PPM solution for large enterprises with capital investment or product development portfolios. Its multi-lingual and multi-currency support and strong partner network makes it an ideal solution for global enterprises. Info-Tech, "Vendor Landscape: Enterprise Project Portfolio Management"
Planisware (...) ha(s) built (its) businesses around the product development space and (is one of the two) clear market share leader. Look for these vendors to differentiate themselves from the other market entrants by offering high-value product technology strategy capabilities, portfolio analytics, and other executive-decision-support features. 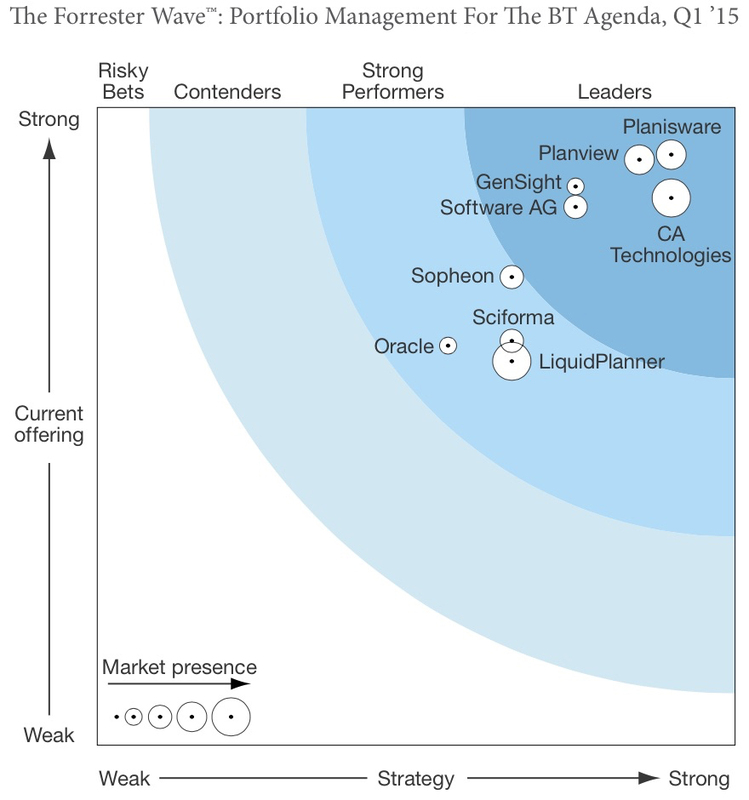 Forrester, "It’s Time To Revisit PPM For Product Development"
Planisware's strength and ability to leverage top-down portfolio management to support the distinct management needs of different classes of portfolio-level elements, as well as (...) competitive analysis (...) for new product planning and development. Gartner, "MarketScope for Project and Portfolio Management Software Applications"
Planisware is a web application built upon HTML 5. For more information, see our page on Connectors. Most Planisware customers choose to host their solution on-premise. Either because you feel your data is too valuable, or this is your IT policy, your organization can purchase your licenses and host the system on-premise. Product upgrades are included in our maintenance services. Customers migrating from one release to the next benefit from the improvements we're making to our products. Planisware Live offers dedicated servers with an infrastructure tailored to the needs of its customers. Planisware Live is a private cloud, an extension of the customer's infrastructure. Noovem is a service based on a shared architecture, with a standard SLA and a common upgrade policy. Download a detailed brochure of Planisware's end-to-end software solution for R&D and new product development. Learn why Planisware is a Champion for Enterprise PPM. 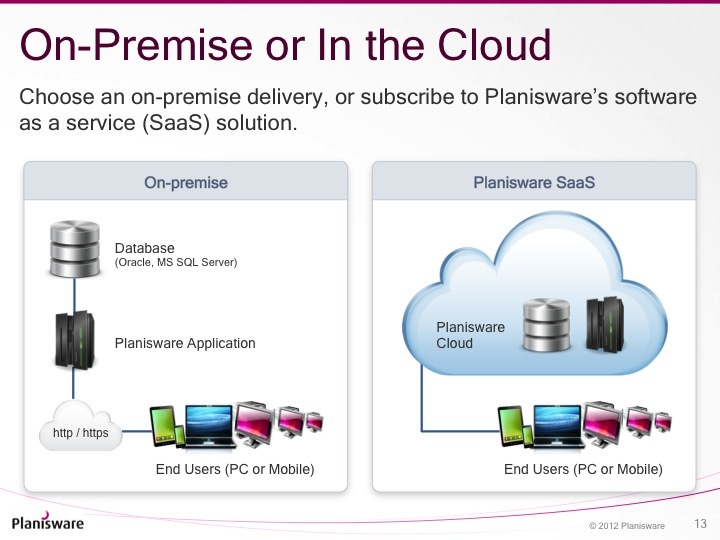 What are Planisware #39;s cloud service options and how do they compare to on-premise delivery?